Cynarin, natural medicine for your liver. A very suitable food for diabetics. Artichoke has always been considered very healthy. Recent studies have shown that this food is a real natural medicine for our liver. The reason for this property has to be found in one of its main components: cynarin. This component has choleretic properties, that’s to say, it increases the production of bile by the liver. By increasing the bile, it helps digestion of food and prevents a number of disorders related to a poor digestion due to liver malfunction: heaviness, heartburn, intestinal gas, flatulence, etc. The increase of bile contributes not only to a better digestion of food, but a decrease in the levels of cholesterol because it facilitates its expulsion from the body and reduces its production in the liver. (Cynarin is widely used as a supplement for the treatment of cholesterol, resulting an alternative method to traditional and highly effective drugs) Cynarin can prevent liver congestion and prevent many liver diseases, such as hepatitis or liver failure. We must not forget that this component has cholagogue properties (it stimulates the production of bile juices) By stimulating the production of the gallbladder, it improves digestion of food, reduces the work of draining the liver and gallbladder. All in all, it prevents the formation of gallstones. Apart from cynarin, artichokes contain inulin, and caffeic acid, two components with hepatho- regenerative properties. That’s to say, the have the ability to regenerate cells of this organ and consequently promote their healing. 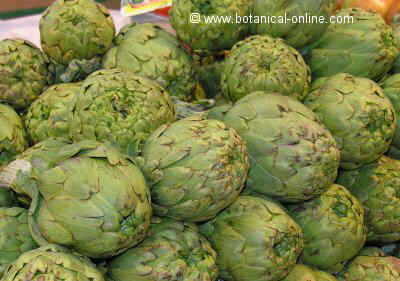 Artichoke is a food rich in diuretic components, capable of removing body fluids. It is very rich in acids (chlorogenic acid, ascorbic acid and caffeic acid) that together with its contents in cynarin and minerals (especially rich in potassium and very good in magnesium and calcium) make this food one of the main resources to increase urination. This property can be used in many situations where it is desirable to increase urine output: fluid retention, obesity, rheumatism, hypertension, kidney stones, excess of uric acid, swelling during the premenstrual syndrome, etc. As for the treatment of obesity, one must be aware that this food has very few calories and a a lot of water. Its richness in potassium compensates for its high sodium content. Furthermore, it is rich in fiber which produces a satiety and avoids having to eat other much more caloric foods, less suitable for people who want to lose weight. It is important to emphasize that this component, in addition to reducing blood glucose levels, helps reduce cholesterol, promotes absorption of calcium (which prevents osteoporosis), increases intestinal transit (thus prevents constipation) and prevents the appearance of colon and breast cancer. With regard to cancer prevention, it should be noted that inulin has bifidogenic properties: Like yogurt, it stimulates the growth of beneficial bacteria in the intestine and reduces the level of pathogenic bacteria. This determines a cleansing of the colon. Consequently it benefits the body which is less exposed to the occurrence of intestinal diseases, such as cancer. Besides magnesium, commented previously, a artichoke is rich in iron which deficiency is responsible for anemia or which ingestion improves some disorders such as restless legs syndrome. At the same time, it can remedy or prevent the onset of diseases such as nervousness, anxiety, depression, or insomnia. Besides, we do not have to forget that niacin aids to stabilize the sugar levels in blood and improves circulation. More information on the artichokes in the listing above.